The boy and his friend the penguin (who first appeared in Jeffers’ extraordinary debut picture book, Lost and Found) ‘always did everything together’. We see them involved in a pretend game, making music and playing backgammon. But one day the penguin wants to do something important by himself – he has wings and he wants to fly. The boy tries to help him realise his ambition but nothing works. On their way to ask for help, the penguin spots a poster asking for a living cannon ball and is so excited he rushes off without the boy. 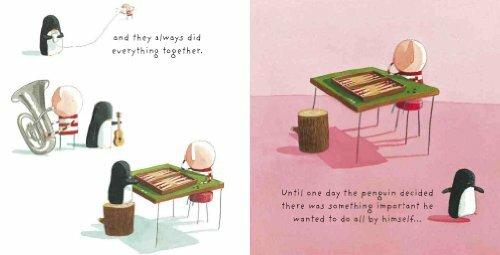 How the friends are reunited is touchingly told and young readers will understand the implicit moral – a good friendship is one that allows each individual the space to follow their own dream. As ever, Jeffers’ minimalist style is deeply expressive with emotion conveyed by the placing of figures in relation to each other or against wide white space. Shadows serve to convey the passage of time or to anchor characters on the page. The now quartet of boy and penguin stories (the other two titles are How to Catch a Star and The Way Back Home) explore aspects of friendship in stories that are perfectly pitched at young readers.